Before you begin the reading of this lesson, write the following words and their definitions in your Social Studies notebook. When you are finished your vocabulary words, begin to read the story. In a rough stone house on the island of Iceland, a group of men gathered about an open fireplace. Tongues of flame from the roaring fire lighted walls where the men had hung their shields, horned helmets, and heavy fur capes. Bearded, weather-beaten faces appeared and faded into the darkness as shadows chased across the room. called Eric the Red and his son Leif. Viking cargo ships carried settlers and supplies to Greenland and Vineland. dragon ships they sailed over 800 miles from Norway to Iceland. They rowed over the mightiest waves and raised their sails in the roughest winds. They fought the terrible monsters of the sea. "Eric the Red was one of the boldest of the Vikings* who lived on Iceland. His tem-per was as great as his power with the sword. His love of adventure was as great as the wide sea around our island. "One day Eric quarreled with his neighbors. His anger became so fierce he drew his sword and started a bloody battle. Because of this act he was banished from Iceland for three years. "After many days, the men came upon the cold, rocky shore of a huge island. Eric sailed along the coast until he reached a harbor. He called the new land Greenland. "Eric and his crew explored Greenland for about three years. At the end of this time they sailed back to Iceland. They told the Vikings there about the land they had found. Then they sailed back to Greenland with cattle, sheep, horses, and seed." Leif Ericson finds lands farther west. The storyteller stopped and looked at the men seated around the fire. They waited eagerly for the storyteller to go on. "Eric the Red had a son called Leif. He, too, was a bold sailor. Leifs ship carried cargoes of furs and walrus tusks from Green-land to Norway. He took iron axes, farming tools, and clothing back to Greenland. "On one of his trips, Leif heard about a huge land west of Greenland. No one had yet dared to set foot on it. "Leif ached for new adventure. He and his crew sailed west, past floating ice and over mountain-high waves. Finally Leif sighted an unknown land. When he went ashore he found patches of wild grain, grassy fields, and large forests. Leif called the new land Vinland. "Leif and his crew sailed back to Green-land and told others about the wonders of Vinland. Whole families of Vikings sailed westward, taking along many supplies. "In Vinland they built a tiny village and planted crops. A people called skraelings (skra'lingz) already lived in Vinland. The skraelings and the Viking settlers fought bitterly. Many people were killed. After three years the Vikings sailed back to Greenland." Is the Story of Leif Ericson True? The stories told by the Vikings were passed on from one storyteller to another. Some of the tales were so popular they were written down, so that people would not forget them. Today we call these stories of the early Vikings "sagas." Long, long after these sagas were written, historians began to study them. "Are these sagas true?" they asked one another. They decided that at least parts of the sagas were true. They knew, for instance, that Vikings had settled in Iceland and that their descendants still lived there. They knew that Vikings had settled in Greenland because explorers had found their cemeteries and the ruins of their ancient houses and barns. "Perhaps," said the historians, "the story of Leif Ericson and Vinland is also true." But where was Vinland? 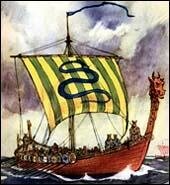 Was there really a Leif Ericson? Who were the skraelings? Historians set out to discover whether the sagas about Vinland were true. For many years they explored the coasts of Canada and the United States, looking for ruins that might have been Vinland. The search of Helge Ingstad. harbor, looking for ruins that might prove the Vikings had been in North America. island of Newfoundland. He thought to himself, "This protected bay would have made a safe harbor for ships coming from Greenland." He began to talk to the men in the fishing village on the bay. "Yes," said one of the men, "there are some old ruins just outside the Village." discovered the foundations and remains of several buildings, including a simple ironworks and a great hall. The hall was similar to Viking halls found in Greenland. Many people are now convinced that these ruins are the remains of the Vinland mentioned in the sagas. We still do not know why the settlement was abandoned. But we do know that Vikings settled in North America about 500 years before any other Europeans reached the shores of the continent on which we live.